This new luxury vacation home investment fund is an interesting hybrid. For a one off payment it offers investors the opportunity to both invest in 30 residences around the world, and to have at least 5 weeks vacation usage at these residences each year. The fund plans to have its 30 homes spread across 20+ locations and has already acquired 3 homes. 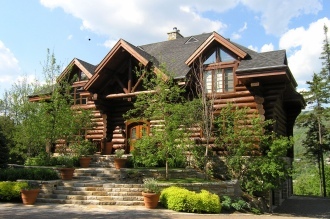 These are a 3 bedroom 4,000+ sq ft log house on Le Geant golf course in Tremblant, Canada (pictured right). The home has views over the golf course, mountain and lake and has its own pool and spa. At the Ritz Carlton in Grand Cayman, there's a 2 bedroom, 2,400 sq ft home. This resort on "7 mile beach" has a Greg Norman designed golf course, a La Prairie Spa and boasts over 1,000 staff to look after every need. The 3,400 sq ft, 4 bedroom house at the K Club in Dublin, Ireland is on the golf course that was home to the 2006 Ryder Cup. The other destinations include 14 in Europe with a mix of beach, mountain, city and leisure locations. Then in the rest of world the destinations will include Miami, Aspen, New York, Bahamas, Turks & Caicos, Seychelles, South Africa and Mauritius. Each investor can reserve 4 weeks on a long term booking basis and then 1 week on a space available (within 2 months of travel) each year. There are no annual usage or maintenance fees. The offer is a UK Limited Partnership with 300 partnership interests. The 20 founder investors will pay £150,000 ($300,000), and after the founder investor slots are filled the unit price rises to £160,000 and then goes up by £2,000 after each new 20 investor are added to a maximum of £186,000. Overall the fund plans to raise a total of £51.4m ($102.8m) which will be split as 67.5% into property, 7.5% as "load" fees (ie marketing and sales costs) and 25% into the "operational float". The operational float pays for future maintenance, local taxes, utilities etc for the first 6 years of the fund, at which time the fund manager will remortgage the properties as necessary to cover additional operating costs. Investors can have an early redemption starting after 3 years, but pay a transfer fee of 12%. This fee is split between the investors and the fund manager 70:30. After 10 years the portfolio will be liquidated in the most profitable way and 70% of the gains returned to the investors. This liquidation could be via an IPO, a private sale of the whole portfolio or the sale of individual properties. Alternatively the fund manager and partners may decide to refinance the fund and extend its life. The funds documentation provides examples of the potential returns as shown in the table below. Based solely on the property appreciation an initial investor would make a 103% return, and this rises to a 210% return with the value of vacations (at £3,200 $6,400 per week) included. *Stage increases of £2000 per 20 interests to total 300 following initial increase to £160,000 at 21 - 40 memberships. ** The open market value of holidays has been reduced to reflect the potential reduced usage allowance. Subsequently, the IRR calculation has been adjusted to incorporate the reduced lifetime of the investment. For more information you can contact Worldwide Private Residences. The equity destination clubs offer a similar combination of financial investment and "lifestyle investment". These clubs include M Private Residences, Crescendo Residences, The Hideaways Club and Ventures Equity Vacation Club which all offer ownership shares to investor members. BelleHavens is also similar although it is primarily a lifestyle choice where the members are owners of the company owning the homes. Each of these equity destination clubs has an annual membership dues payment in addition to the initial one time share purchase/membership fee. One big difference between the fund and the destination clubs is the ratio of members to homes and the likely impact this will have on occupancy and usage. The fund will have 10 investors for each of its 30 homes. With each of these investors having 5 weeks usage a year (50 weeks in total) the homes could end up being fully booked, meaning that some investors may not get the homes they want when they want. The destination clubs typically have 5 to 8 member/investors per home and the homes usually have an occupancy ratio of 45% to 70% so are empty (and available for members) a large part of the time. Editorial Update: This club was launched in 2007, but never really got going and was closed during the economic downturn in 2008-2009.